As migration proceeds in fits and starts I find myself torn between wanting to find as many birds as I can on each birding outing and wanting to take my time with each species that I haven’t seen since they left for fairer climes back in the fall. It is a conundrum and one that I don’t mind not being able to figure out, just so long as there are any birds at all around to see. On a recent visit to Jamaica Bay I took my time with each species that I found that was being remotely cooperative and also burned a bunch of time hoping that some fickle feathered freaks would become cooperative. Sadly, my first Black-and-white Warbler and Blue-headed Vireo of the year were both unwilling to cooperate. I made up for it with a remarkably obliging Polioptila caerulea. 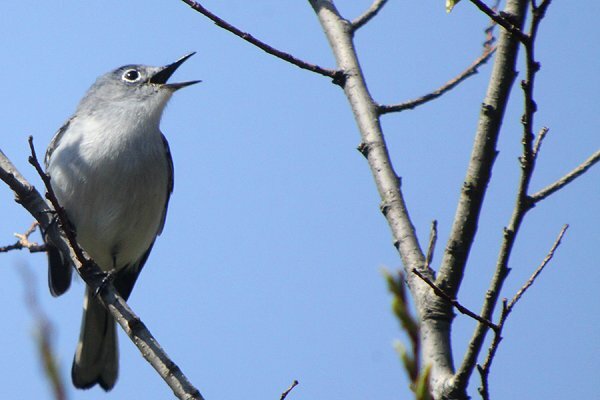 Blue-gray Gnatcatchers tend to forage rather high up in tall trees and generally the only way to even know that they are up there is to hear their plaintive little voices. But even knowing that they are up there only goes so far because they are tiny and the trees have leafed out early this year, which means that a quick glimpse of the bottom of a gnatcatcher is pretty much all that I expected when I heard one calling in Jamaica Bay Wildlife Refuge’s North Garden. I was pleased when the bird turned out to be foraging in a relatively low tree that had sprouted very few leaves though I was less than pleased with the location of the sun, which was not entirely behind the bird but was close enough to make digiscoping this particular Blue-gray Gnatcatcher tough. 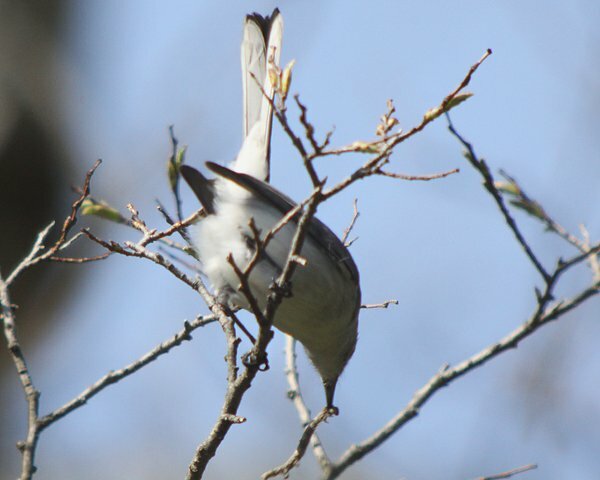 First of all, can you figure out what is so interesting to the gnatcatcher in the following picture? Don’t see it? Don’t worry. It took me watching what happened next to figure out why the gnatcatcher was staring so intently at those twigs in front of its face. In his book Summer World: A Season of Bounty, Bernd Heinrich writes about an experiment that he did with some students. He put caterpillars like the one above in a small tree and asked the students to find them. It took a very long time for any individual student to find the first caterpillar but once they found one they found finding the rest very easy. Once you know what method the caterpillars are using to hide you know not just what you are looking for but how to look. 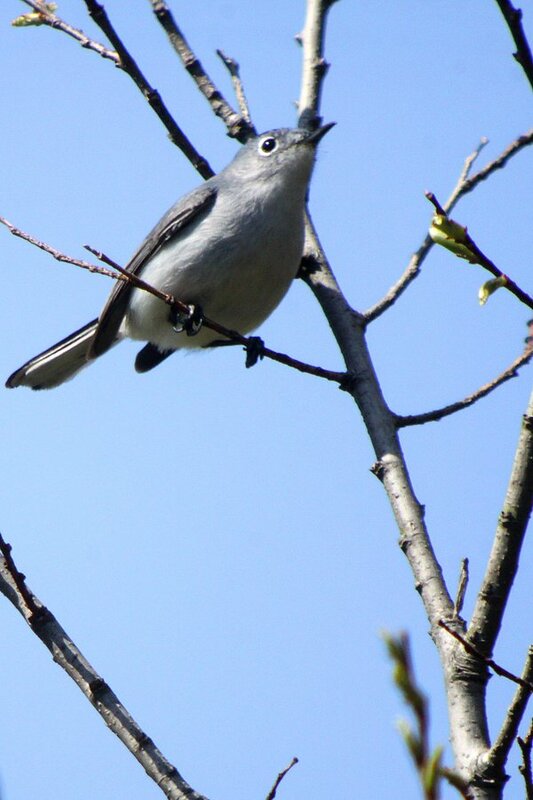 And this gnatcatcher knew how to look. 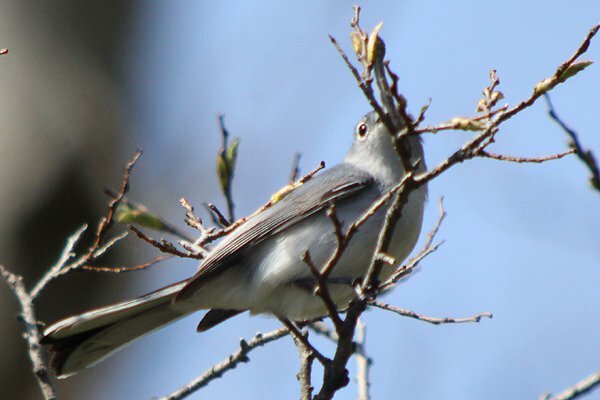 In addition to the two above I saw the gnatcatcher catch one more caterpillar in the twenty minutes I spent with it making me think that this individual should be a Blue-gray Caterpillarcatcher, though that is almost as much as a mouthful for birders as the caterpillar is for the bird. 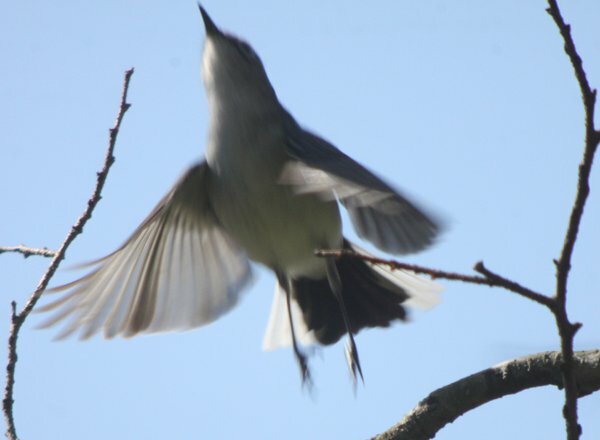 The gnatcatcher did more than just forage. 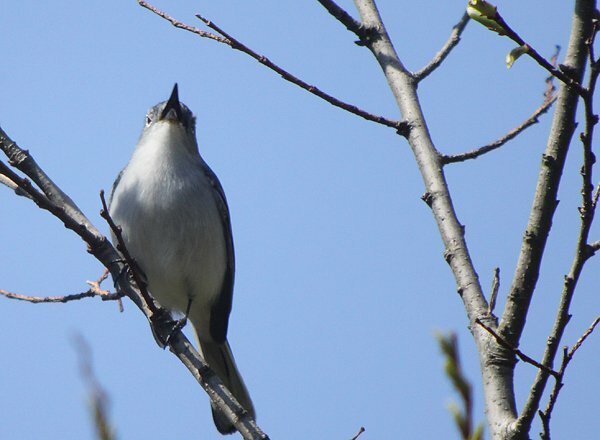 It also sang, and even if its song will never inspire poets or even attract much attention it sure put its all into singing! Take some time with the birds this spring. They are worth the extra attention and once they have moved through or, worse, left for the winter, you will wish that you had spent that extra five minutes with that bird. And, who knows, maybe you’ll see something that you never saw before. Great post, Corey. I noticed that the more I learn about birding and the more species I see, the more I appreciate the common species that I’ve known all my life. I enjoy taking pictures of the every day robin and the Canada geese … both are very photogenic and fun to watch. This is such a wonderful hobby. Aah, but can you identify the worm? @Seth: I could not. Thank you!